The genus Grevillea is probably the most popular and widely cultivated of all of Australia's plant genera. The reasons for this are not difficult to find. 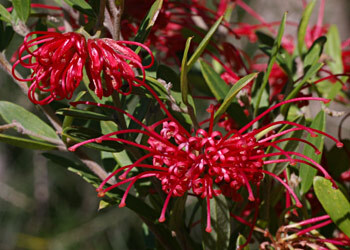 The plants occur in numerous shapes and sizes so that there is a Grevillea for almost any conceivable garden situation. Added to this are the colourful flowers which, in many cases, attract birds. Grevillea is a member of the Protea family (Proteaceae) and its close relatives include Banksia, Hakea, Isopogon and Telopea (the Waratah). Grevillea is named after Charles Francis Greville who was one of the founders of the Royal Horticultural Society in 1804. There are over 300 species in the genus, most of which are endemic to Australia but a few species occur in Papua New Guinea and islands to Australia's north. The inflorescences can be quite variable in arrangement but two that are commonly recognised are the "spider" flower arrangement,in which the flower styles arise from a rounded inflorescence like the legs of a spider, and the "toothbrush" arrangement, in which the individual flowers are grouped into a short inflorescence along one side of the floral axis. Another common inflorescence, particularly in cultivated plants, is the large "brush" shape where the flowers are clustered into cylindrical racemes usually at the ends of branches where they are very conspicuous. Grevilleas can be seen in flower at most times of the year but winter to early spring would be the peak flowering period. Following flowering, thin-walled seed pods develop, each containing one or two seeds. The pods open when the seed is mature. Seeds often have a papery wing to allow them to be distributed by the wind but this is not a universal feature. The majority of grevilleas occur in areas where bushfires are relatively frequent. Although a few can regenerate from lignotubers or epicormic buds after a fire, most are killed by fire and rely on seed germination for their continued survival. 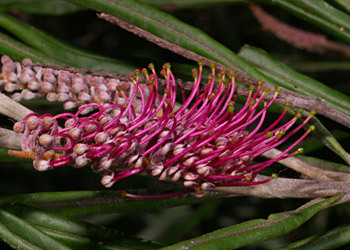 Two typical inflorescences seen in Grevillea are the 'spider flower' arrangement (e.g Grevillea speciosa - left) and the 'toothbrush' arrangement (e.g. Grevillea asplenifolia - right). Most grevilleas are small to medium shrubs but some are prostrate and a few can become large trees. The various species hybridise readily and most of the named cultivars and hybrids available in nurseries have resulted from chance hybridisation. Some deliberate breeding is being undertaken by Grevillea enthusiasts. One of the great features of grevilleas in gardens (apart from the colourful flowers) is that many attract honey-eating birds which act as pollinators for the plants. A number of species rely on other methods of pollination, eg, beetles, moths, bees, ants, and even small marsupials.